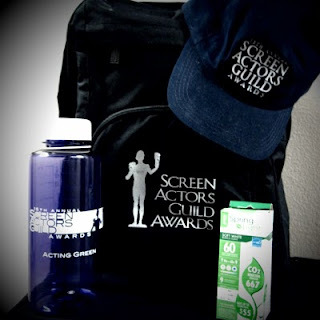 The SAG Awards Blog: Win Free Stuff! This week we're running a contest on our twitter to promote our Bleacher Seat Auction! If you haven't heard about it yet - let me tell you. 4. There's a good chance you'll be on TV and your mom can say "OMG I see you"
5. There's a high possibility that there will be a food truck you can eat at afterwards. Okay, let's get back to winning free stuff. All you have to do is follow us on twitter (@SAGawards), re-tweet "Bid on SAG Awards Red Carpet Bleacher seats! LIVE NOW from Jan 4-11. http://bit.ly/6IAP8T RT to enter to win a @SAGawards prize pack." And you're entered to win. It's that easy. Don't you like easy? I do. Today, we announced a few names of people who are going to present at the show - some really hot names. Personally, out of that group I'm most excited to see George Clooney (are you shocked?) and Chris & Michelle were super sweet at nominations - so I'm glad they're coming back. There are some more really awesome people that we'll be letting you know about in the next week that I promise you won't want to miss either. Bid now!! Click here to bid. Auction ends January 11th!